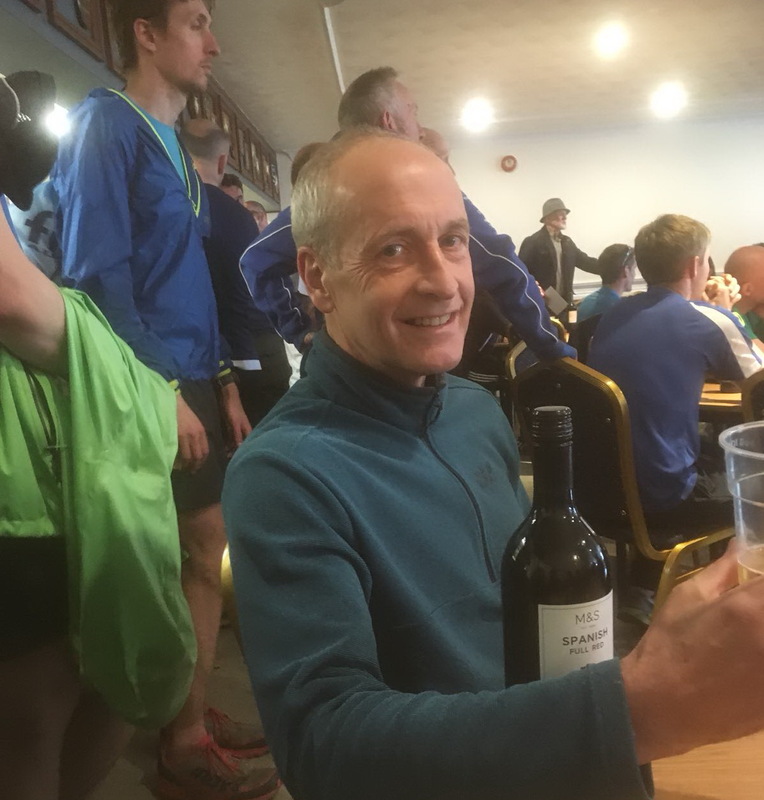 British Fell Relay Championships 2018. 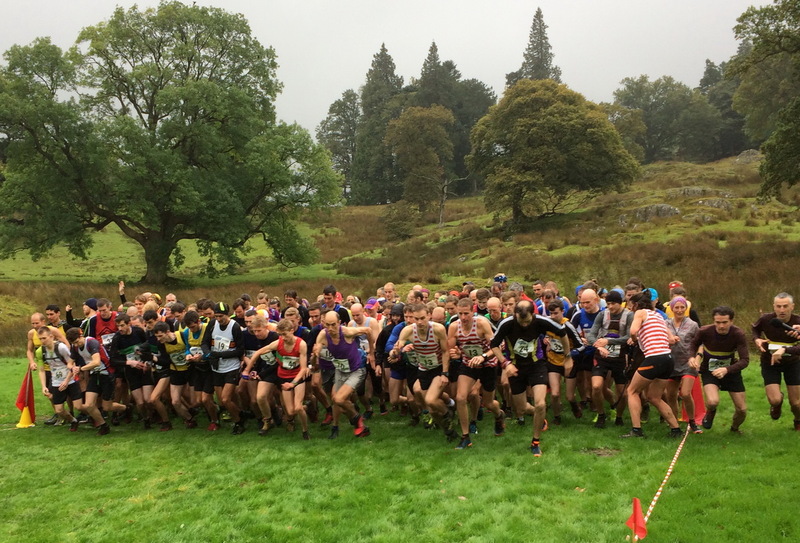 This year’s Relay Championship took place on Saturday 20th October at Grasmere and was hosted by Ambleside A.C. The event consists of 4 legs; a solo leg, a paired leg, a paired navigation leg and then a final solo leg. NFR fielded 2 teams. 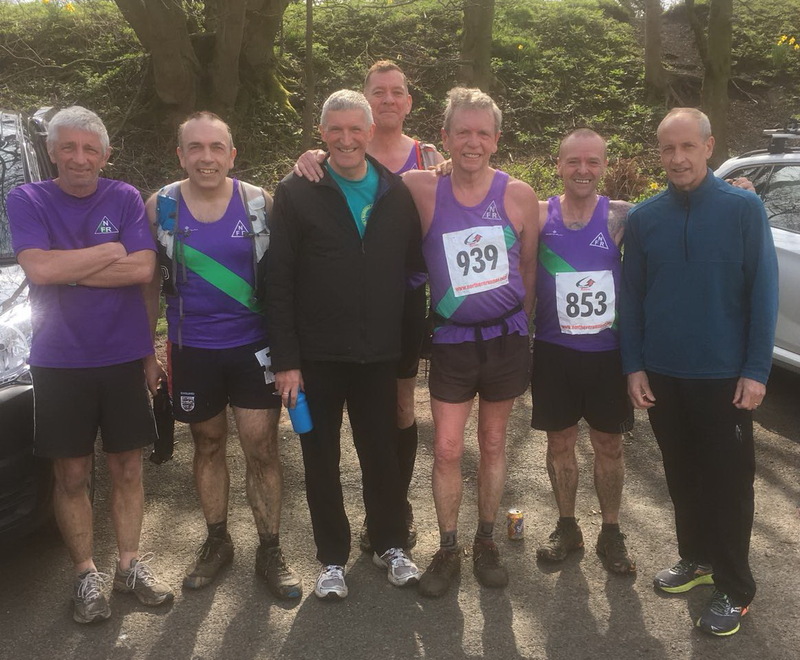 The A team consisting of John Butters (leg 1), Matt Hetherington and Roger Sillitoe (leg 2), Lee Bennett and Paul Appleby (leg 3) and Matthew Briggs (leg 4) and the B team made up by Phil Green (leg 1), Gary Mason and George Nicholson (leg 2), David Armstrong and Frank Shillitoe (leg 3) and John Tollitt (leg 4). The event was a sell out with nearly 250 teams from throughout the UK taking part and was contested in dreich conditions with stubborn low cloud persisting throughout the day. The NFR A team finished in 62nd place whilst the B team finished in 132nd. The winning men’s open team was Pudsey and Bradley and the women’s open team winners were Helm Hill. An excellent turn out for this multi championship race, 117 is a record under my stewardship. Ian and Ann Webb were about on the day to give support. Nick Swinburn still has the Mark Webb trophy and would be good to get it back for next year. The Ladies trophy is AWOL and it would be good to have it back. Any one ask at Tynedale if its knocking about? The race had a flurry of late entries due to a serious crash on the A1 at Morpeth but we got underway on time. I will need a bit more support to organise this race in future is folk don’t mind. The loss of marshals in the immediate run up to the race made it more stressful than usual. So Alan and myself marked the course in the morning after last year’s problem with disappearing tape. Thomas organised registration with various Greens, Mrs Langford and Mrs Cameron. Harry Ransome kindly ran up and marshalled the top. Richard Garland kindly sorted the Bridge marshalling on the way out. Rothbury Pipe band played out the race with Barren rocks of Aden/ Highland laddie. Next year may see a lap of the field on the way out…. Matthew manned the gate for those that came back the race route via the burn. The finish team of Sharon G and Jules L on finish number and place recording, Alan L and Lesley Ransome on timing. Nina and myself on results compiling seemed to work very well. However the pressure to sort results resulted in a couple of errors with Clare Bagness of Wooler being overlooked for the FV50 prize and Garry Owen being missed as well. I corrected these before the finish of prize giving. The race will start at 1400 next year to give more backend time to sort results. I tried marking the route with biodegradable flour this year and would be keen for direct feedback. I ran the route Monday night and the arrows were still clear to follow…. “Many thanks for the support from the club with the turn out today. Many thanks to Thomas and Matthew Green, Jules and Alan Langford for registration / time keeping and John Tollitt for sweeping the race. We made £210 quid for North of Tyne MRT today who were kindly present on the route. Find attached provisional results, any corrections to me directly not via egroup. 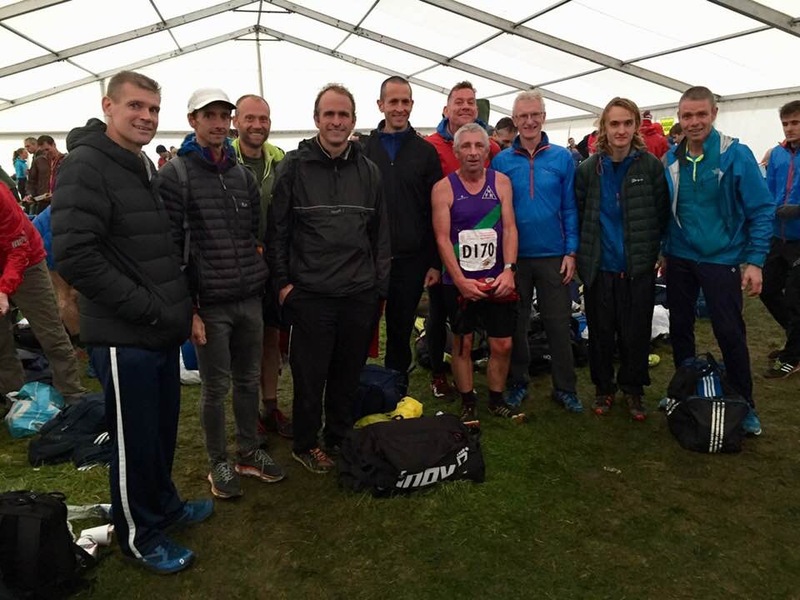 Some nice photos from Glen’s Ingram Valley – Wooler Trail race on the Breamish Valley website – with thanks to Graham Williamson. Poor weather conditions meant this year’s Hodgson Relay was over a shortened route. It was essentially an out and back course from Patterdale to Kirkstone via Hartsop. The high tops of High Street to the east and all the western route over Red Screes and Fairfield were omitted. This was due to forecast low cloud, rain, and high winds. NFR ran well with no mishaps or poor route choices. 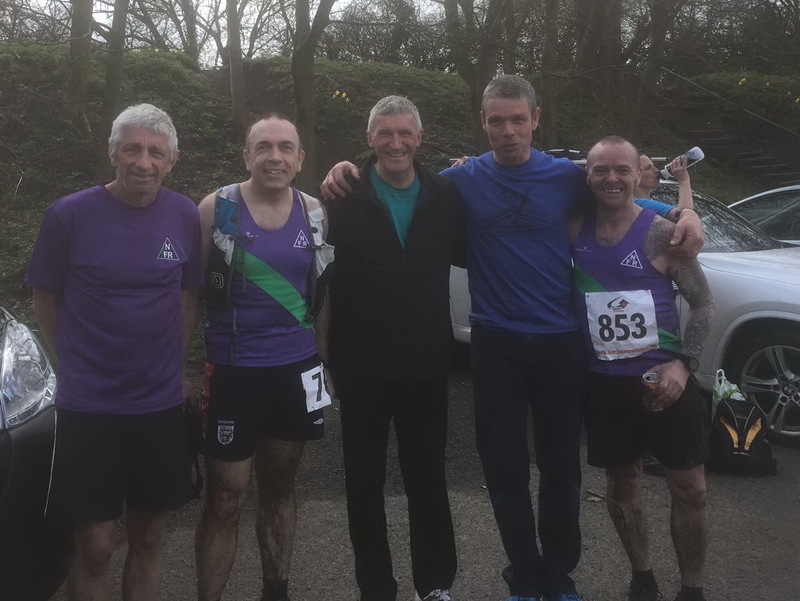 John Tollitt and Matthew Briggs ran leg 1 from Patterdale to Hartsop via Angle Tarn. There was a mere 38 years age difference, and they were soon handing over to Roger Sillito and Scott Gibson for leg 2. Scott’s local knowledge was rewarded when they hit Caudale Moor Tarn spot on when others went walk-about. Kirkstone Pass was a cloudy and dreich affair with runners appearing out of the mist without warning. Mark Clarkson and Andy Higgins took over the baton for leg 3. Despite no prior recce, they ran superbly and were soon running back into Hartsop having made up several places. Steph Scott & I took over for the last leg back via Angle Tarn. Even this leg was firmly in the clag. As we emerged from the mist at Boredale Hause, the finish PA system was sounding eerily over the valley. NFR finished 32nd overall. Many thanks are due to the organisers/marshals for their sterling work in putting the relay on in difficult conditions. Also thanks to Jane & Mike Briggs who provided support and invaluable transport on the day when parking was difficult. The Borrowdale hegemony has now been well and truly broken. This year the relay was won by Keswick AC. 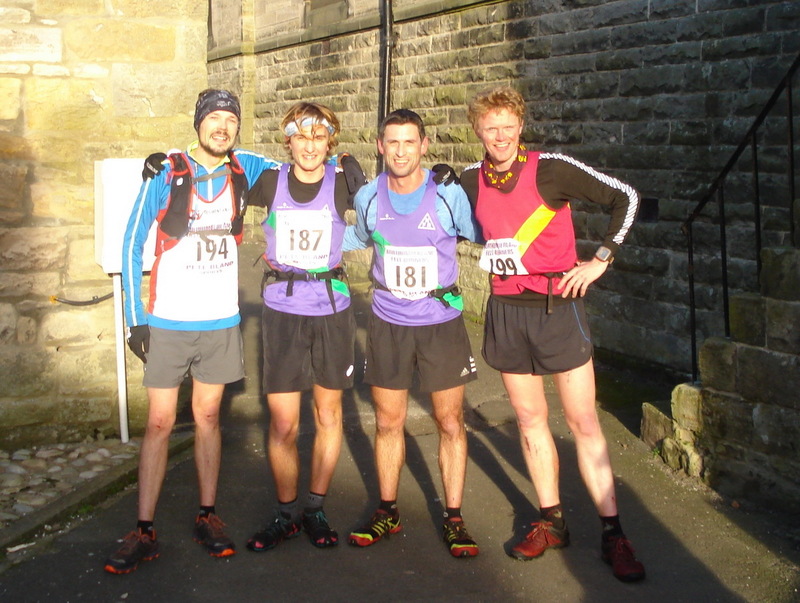 Their team included Chris Edis who ran for the north-east in the inter-counties, and Carl Bell. One of Carl’s early races was at Lakeland Country Fair – click here if you want a walk down memory lane to see some youthful NFR faces – and he is now British Champion. The ladies’ race was won by Ambleside.